The UN plans to deliver aid to about 150,000 Syrians in besieged areas over five days during a partial truce in the country’s civil war. A United Nations spokesperson said the organisation was ready to help an estimated 1.7 million people in hard-to-reach areas by the end of March, after a cessation of hostilities began with complaints of breaches from both sides. The cessation, which began on Saturday at 11am New Zealand time, otherwise appeared to be intact with a key Syrian opposition group saying the situation was much better. The truce was "the best opportunity that the Syrian people have had over the last five years for lasting peace and stability", according to UN humanitarian coordinator in Syria Yacoub el-Hillo. The organisation was planning to use the lull to deliver food, water and medicine to towns like Madaya, where residents had reportedly been starving to death, but a spokesperson said it needed approval from Syria’s warring parties before it could further expand its deliveries. Efforts to deliver aid to Islamic State-besieged Deir al-Zour by air last week failed when several pallets disappeared, were damaged, or landed in no-man’s land. The UN estimated almost 500,000 people were living under siege in Syria. 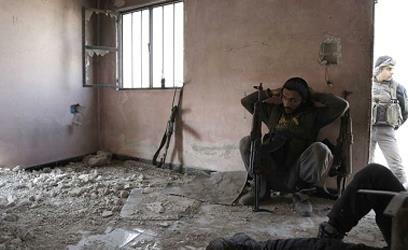 Syrian rebels take a break as they hide from regime forces in Bala on the Damascus outskirts. The main Syrian opposition grouping had complained of several violations of the ceasefire by the government side, which is supported by Russia. The High Negotiations Committee said it would be sending a formal letter of complaint about the breaches to the UN and world powers. However, it was "positive to see people getting relief ... to be safe, and free from fear" despite violations "here and there", an HNC spokesperson said. Russia also complained of several breaches but said "on the whole, the ceasefire regime in Syria is being implemented". The Syrian Observatory for Human Rights said several air strikes had pounded northern Aleppo province. Western powers have accused Russia of attacking moderate rebels fighting Syrian President Bashar al-Assad. It was hoped the cessation would pave the way for a formal ceasefire, with UN special envoy for Syria Staffan de Mistura saying peace talks would resume on 7 March if the truce "largely holds".